Introducing my new blog with a tribute to my daughter Bridget, who was married to Zac on October 8th, 2011. She wanted a burlap and lace wedding on a country farm and after months of searching, she found just the right venue that blended rustic charm with lots of rural beauty. I just love the cowboy boots with the short bridesmaid dresses. The bride is wearing cowboy boots, too! 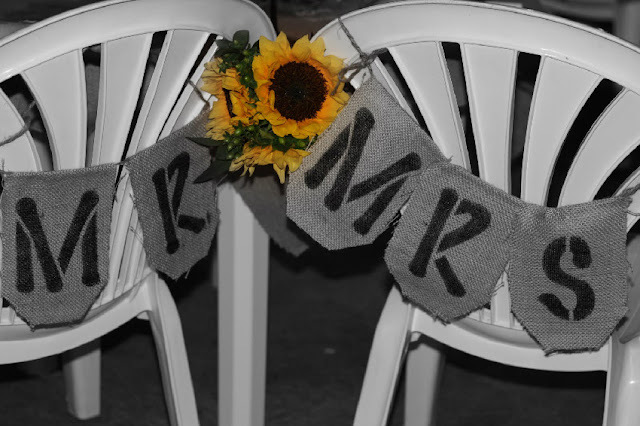 We used quite a bit of burlap for her DIY wedding. 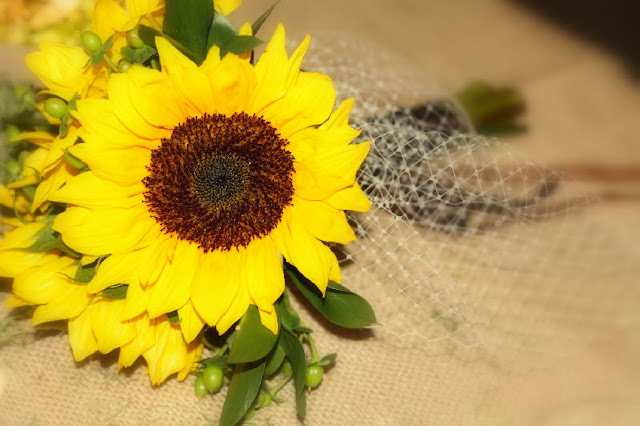 Here, sunflowers and lace display their feminity against a burlap tablecloth (I made all the tablecloths for her burlap and lace wedding). Rustic burlap Bride and Groom banners were placed on the fencing signifying which side guests should sit on. All photography is courtesy of Heather Douglass. 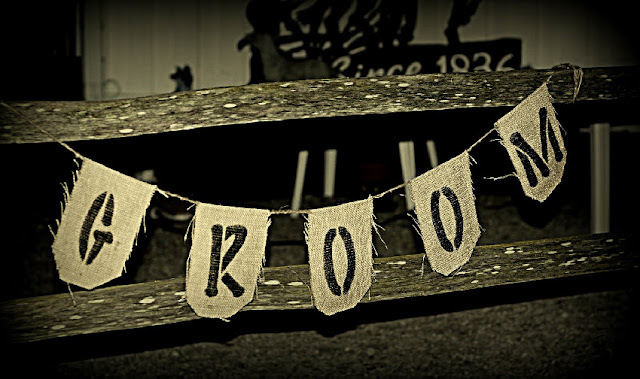 Another burlap banner for the reception dinner. I looked online for burlap banners and created my own version of what I found. 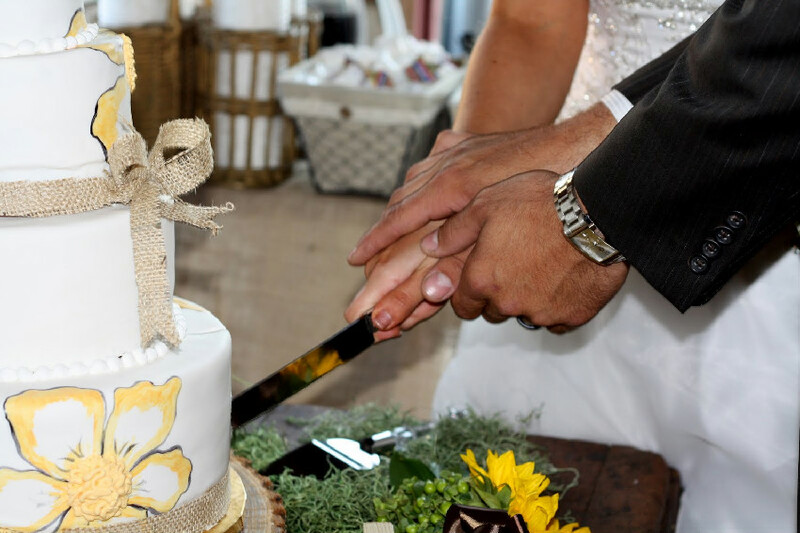 Even the cake got into the act with a few burlap ribbons. The flower girl (niece of the bride and my granddaughter) was pulled up the aisle by her big brother, the ring bearer. 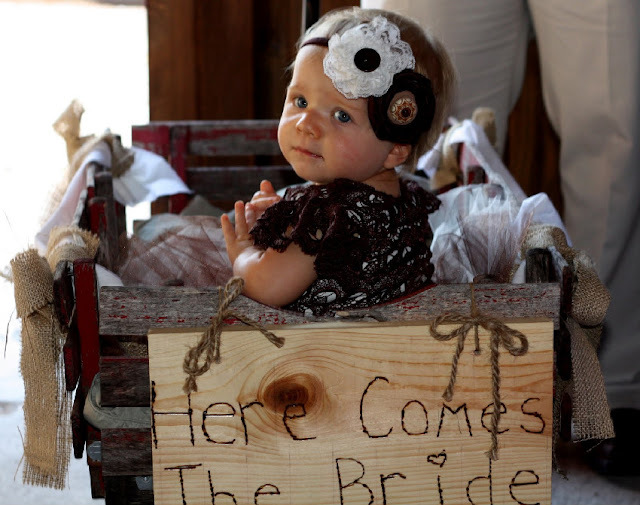 We decorated this rustic red wagon with burlap and muslin bunting. 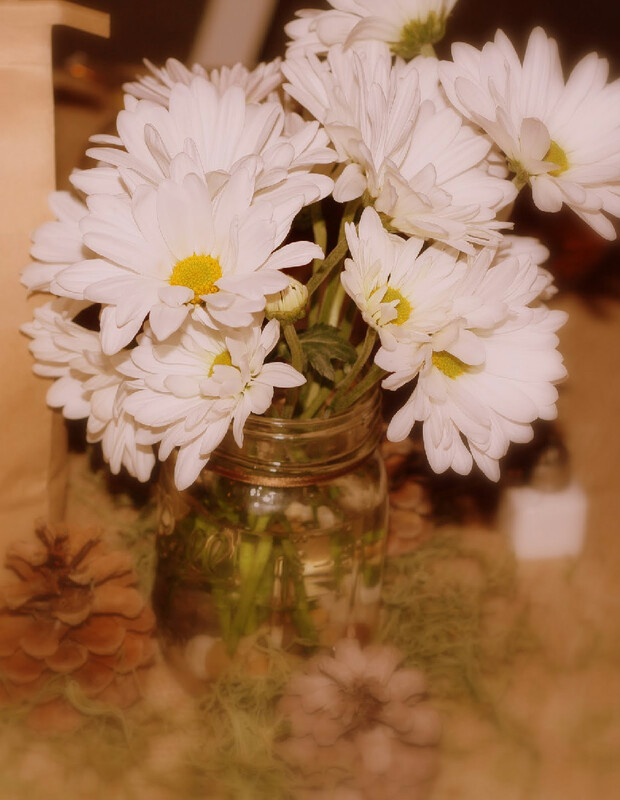 Daisies in Ball mason jars were set on each table, with a light dusting of spanish moss and a few pinecones. 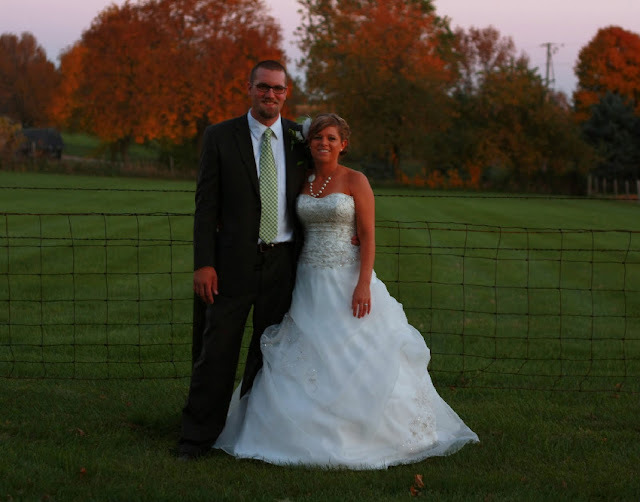 Love this picture with the barbed wire fence providing a contrast against her organza, beaded dress. 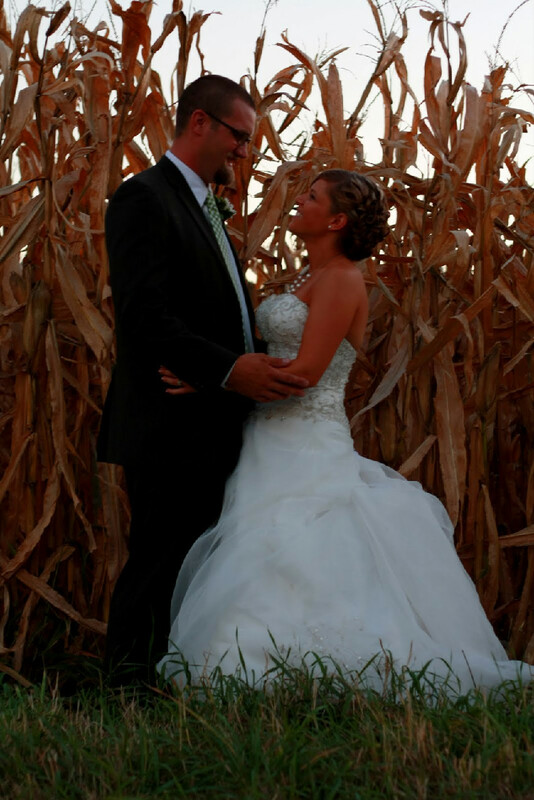 Of course, you can’t have a country wedding without a cornfield. 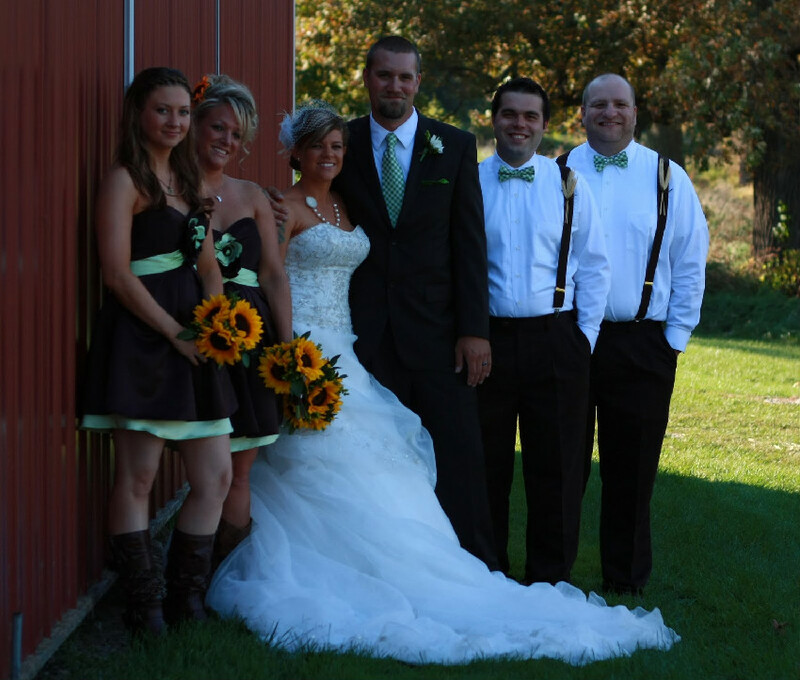 The weather was near perfect for Bridget’s burlap and lace wedding. You can see more photos of this wedding here. Thanks for visiting, and welcome to my blog where I’ll share everything I love about living where the suburbs of Chicago meet the farm fields of the country. Thanks Shawna. You’re the first to leave a comment on my new blog. Beautiful wedding full of fun details! I went to college in Chicago & agree you can get out of the city quickly… best of both worlds =) Congrats on your new blog. My son just got engaged yesterday, so we are having a vintage theme wedding next November, I am coming back to steal all of your ideas!! A beautiful wedding , I love tradition in a non-traditional way ! Thanks ladies, for all your nice comments! Fabulous wedding touches, Jennifer! That cute little flower girl and the “here comes the bride” sign are precious!! Thanks for linking up to the Burlap Week party at WhisperWood Cottage! Very pretty pics! I’m now a follower of yours! Thanks for coming by my blog G Inspires! Wow, absolutely gorgeous photos! 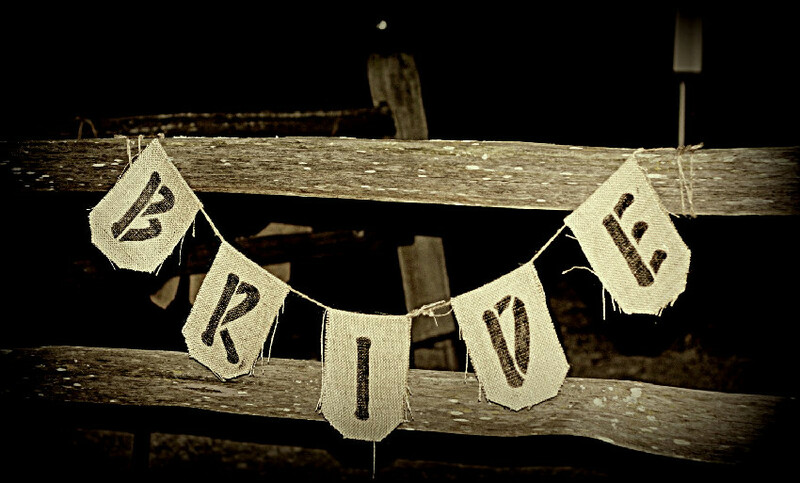 Love your burlap and other touches. Love the twist of rustic and elegance! I have looked everywhere for the contact info for the Davis farm in Big Rock with no luck. Everyone had told me how beautiful it is. Could you give me the info?